In 1900, Patriotism is added as the fourth principle of the Order. The 1st Exemplification of the Fourth Degree took place on February 2, 1900 at the Astor Hotel in New York, NY. 1,100 Third Degree members were exemplified. They had to have been members for 3 years. The 2nd Exemplification of the Fourth Degree took place on May 8th in Boston, Massachusetts. 750 Third Degree members were exemplified. Since that First Exemplification in 1900, there have been three major styles of swords with black grip. The first major type of sword had a Flying Eagle on the pommel (grip cap) and the Emblem of the Order on the Guard. 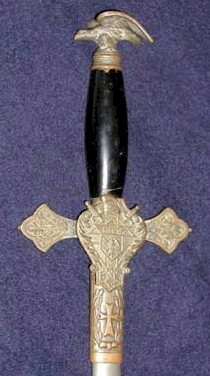 This type of sword was made until at least the early 1930’s . The sword blade was usually 28 inches in length with the overall length in the scabbard being 37 inches. You may click on any sword to see a larger more detailed picture. 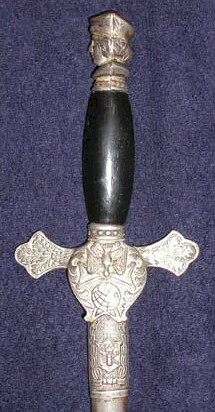 The second major type of sword, dates back to mid to late 1930’s and has the head of Christopher Columbus, the Order’s patron, on the grip cap. The sword is worn hanging from the Service Baldric on the left hip and Columbus’ head is facing forward. If you were looking at the front of the sword, Columbus’ head is facing left. The third major type of sword is the one that is still in use today and began to be manufactured sometime in the 1940′ or 50’s. The most identifying characteristic of this type of sword is the that Columbus’ head on the pommel (grip cap) is now facing forward when you look at the front of the sword or facing right when the sword is worn on the service baldric. The English Company and Lynch & Kelly are the two primary manufacturers of swords in the United states today. Also, the guard, while still displaying the Triad Emblem of the Fourth Degree, has varied over the years. There has been more and less detail in the triad as well as varying from a raised emblem to flatter style. Again over the last 40 years the blade, sword, and total length have varied as with the second type of sword. Finally, the blades have varied in style as well. Sometime the blades are plain and others contain etching on the blade. Usually, the etching says Knights of Columbus on one side. There are two other types of swords that you may see. Both of them have a white grip. The first is the same metal color as the swords with the black grip. The white grip indicates that the sword belonged to a Faithful Navigator and can be worn by either a current Faithful Navigator or Past Faithful Navigator. Most of these swords are of the etched blade variety and have the words Knights of Columbus etched on one side and the name of the Faithful Navigator on the other side – i.e. John Smith, PFN. The final type is a white grip sword, but plated in gold (not pictured). This sword is worn by current and former Masters, Vice-Supreme Masters, Supreme Masters. The source for this page came from an old webpage of Assembly 220 that is no longer available. We thank them for the information.